BRIAN HEAD – State and local politicians are blaming the Brian Head fire in part on environmentalists who, they said, are responsible for the quick-growing fire that in just a week has destroyed nearly 50,000 acres of forest and several structures. “When we turned the Forest Service over to the bird and bunny lovers and the tree-huggers and the rock-lickers, we turn our history over,” Rep. Mike Noel, R-Kanab, said during a news conference Monday in Brian Head. In an emotional plea to the public, Noel showed several pictures taken by Garfield County Sheriff Danny Perkins of the fire area. The pictures showed what Noel said was an unlogged area destroyed by the fire, while another picture of tree stumps among unburned trees represented the results of logging. The Utah representative pointed fingers at “The Friends of the Dixie National Forest,” for stopping the logging in 1993 via a lawsuit in U.S. District Court and in turn, Noel said, allowed the beetles to overtake the forest. “The Friends of the Dixie National Forest,” was an environmental group that stated its goal was to protect the natural and scenic values of the forest. However, many locals now blame the organization for the fire. The cost of the Brian Head fire is quickly approaching $10 million but could rise as high as $20 million, possibly making it the most expensive fire in the state, Cox said. The U.S. Forest Service and Bureau of Land Management are sharing the costs since some of the fire is not only on state and local lands but also federal lands. However, Cox admitted that price tag does not include future costs that may result from the fire’s aftermath. Meanwhile, fire crews were busy working the fire scene Monday afternoon as the red flag warning helped to spread the fire to 46,000 acres, nearly another 3,000 acres from this morning when officials reported it at 43,436. The fire remains 10 percent contained with most of that in the Brian Head area where the fire began June 17. More than 300 firefighters joined the 37 crews Monday making the total number of firefighters 1,427. There are now 67 fire engines, 18 more than in the morning, along with 13 helicopters. The Type 1 Incident Management team also officially began work Monday morning and is now overseeing the fire suppression on the east side of the Brian Head fire from Panguitch. The Type 2 team remains in command of the western side of the fire from Parowan. Tim Roide is the incident commander for the Type 2 team while Kim Martin is the incident commander for the Type 1 team. The two teams will coordinate closely to ensure the safety of the public and the firefighters. Southwest winds returned to the area Monday causing the fire to increase in activity, officials said. On the northern perimeter of the fire, wind gusts around 30 mph fanned 100-foot flame lengths and caused spotting of a half mile. Red Flag weather conditions are expected through Wednesday, indicating a high potential for extreme fire behavior. Fire crews are looking several miles north of the fire perimeter, to where the fuels change from old-growth timber to sage and grass, before they expect more successful suppression efforts. Employees from the Department of Transportation and local utility companies worked in Parowan Canyon to assess damage from the fire and make infrastructure repairs in anticipation of opening Brian Head soon. The town continues to have power; however, other utilities are still disrupted and the roadway requires some minor attention, a news release issued by Color Country Fire Interagency stated. Additionally, officials are concerned about falling trees and other debris regarding safe travel up the mountain. To solve this issue, numerous dead trees located adjacent to the highway will be cut down to ensure they do not block travelers. Firefighters plan to work off the constructed dozer line Tuesday, along with the southern flank of the fire to clean up remaining hot spots and strengthen the containment line. They will also continue to secure and mop up any hot spots that remain around structures in the Panguitch Lake area. Current evacuations – The following communities remain evacuated per local law enforcement: Upper Bear Valley, Panguitch Lake, Horse Valley, Beaver Dam, Castle Valley, Blue Springs, Rainbow Meadows, Mammoth Creek, Dry Lakes, Second Left Hand Canyon, and the town of Brian Head. Evacuees can contact the Red Cross for shelter information. If you live in an area affected by wildland fires, officials recommend familiarizing yourself with the Ready, Set, Go Program (http://wildlandfirersg.org/). Closures – Highway 143 is closed from the cemetery in Parowan to milepost 50 outside of Panguitch. Mammoth Creek Road is closed at the junction with Highway 143. The north side gate of 143/148 is closed. 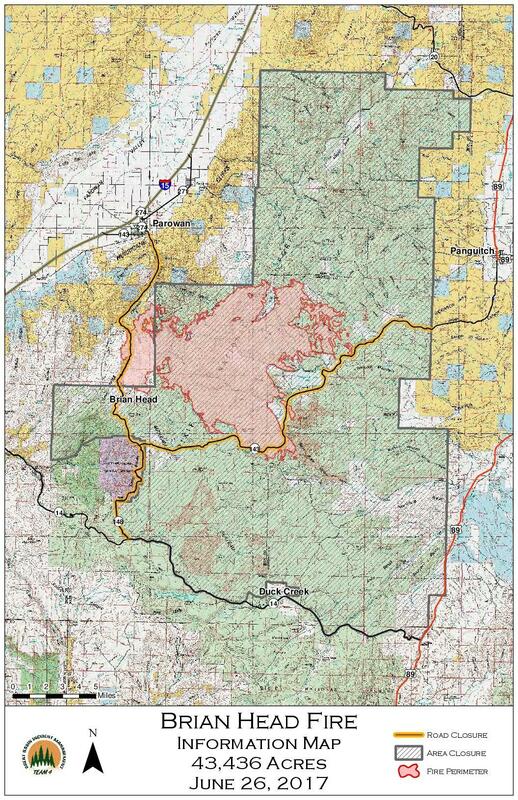 The Dixie National Forest has expanded its area closure to include Forest lands north of Highway 14. Check your route before planning recreational activities. Maps of the closure area are posted at https://inciweb.nwcg.gov/incident/5253/. I don’t have a dog in this fight nor the knowledge to know for sure who’s ultimately to blame. That said, shouldn’t a journalist who prints criticism (true or not) about organizations or people of a particular political persuasion a chance to share their side of the story? Repeat after us: “it’s all the libruls’ fault”. I have trouble believing that the blame can be that one-sided. People have stated that the fire started and became massive on private land before spreading onto forest service managed land. If this is true then you wingnutters are total hypocrites and liars (as usual). bunny lovers? tree huggers? rock lickers? hahaha, the guy is a wingnutter and likely a loon. Likely a moron trump voter. I guess if you are a loser, straight talk goes over your head. Is Hildy or Bammie still your idols? @Mike Noel, your a rock star in my book!!! Great comments. We could sure use a deluge of snowflakes in the Brian Head fire…not the liberal kind, but, the cold weather kind. Since 1993, for 24 years, you have turned over the land to “the bird and bunny lovers and the tree-huggers and the rock-lickers”. I guess that has ended since you have now turned over the land to the oil suckers, and the coal and natural gas snorters, and the strip mine monsters. Let’s wait and see what happens to the Utah water supply over the next 24 years. You think a fire is bad, wait until all the residents of Utah are so sick from the polluted water (the Green and Colorado) and the Trumpcare insurers leave our state. What happens to the idiot with the fire torch? The environmental extremists are responsible for considerable damage: the above, London apartment fire killing over 80 people, loss of jobs, death of animals, terrorism. Extremist’s are dangerous from any quarter. Why did you remove that embarassing segment of Commissioner Tebbs? That was the best part of the show! Representative Mike Noel hit the nail right on the head dead center. Everything is said is 100% true. Anyone who would disagree with his statements, knows he is right, they just don’t like it. Here it comes, the two weeks each year that I grit my teeth and hold my breath… As if 1 day weren’t enough of a risk, our officials allow John Q Public to play with fire for an entire week surrounding the 4th of July and Pioneer Day! If an adult can’t even be trusted with a weed burner, how can teens be trusted with bottle rockets and high-flying fireworks? I hate to squash anybody’s idea of a fun time, but how would you like your home burned to the ground? Fireworks should only be allowed in officially sanctioned public displays – even then, accidents still happen. Unlike choosing not to wear a seatbelt and endangering only yourself, exercising your personal right to set off fireworks endangers everyone and their property. Our officials should show some common sense and outlaw amateur fireworks altogether. These other things like un-attended campfires, weed burners and target shooting….well, unfortunately you can’t outlaw stupid! The only reason Fireworks stands are still here and selling to the public during the fire disaster is because of pure greed….Hell, ever Brian head officals are telling the public all should be fine by the 4th as they are counting on 15,000 people up there spending money………and I guess the environmentalists are to blame for the endless contstruction going on all across southern Utah now, what the hell ever happend to “Vision Dixie” and Smart, Controlled Growth? …Oh Well, guess they got paid off too huh?